(MONEY Magazine) -- For three decades, Bob Lowry consulted for small radio stations, logging more than 100,000 miles a year on the road. Then media conglomerates began gobbling up his clients. By 2001, at age 52, Lowry faced a tough choice: "I could reinvent myself or retire and make do with what we had." Bob and his wife, Betty, then 47 and a preschool teacher in their hometown of Scottsdale, took a hard look at their finances. With $850,000 saved, they were short of their $1.2 million target. To retire a decade earlier than planned, they calculated that they needed to live on $45,000 a year, less than a third of their $150,000 income. Ten years into their austerity plan, the Lowrys have found themselves pleasantly surprised by how satisfying retirement has turned out. They moved to a smaller house and postponed vacations, but they still eat out, travel, and go to the theater. "We thought our life would be filled with cruises and month-long vacations. Not much of that happened," says Bob. "But we're not missing anything. What makes us happiest is much closer to home." Whether it's because of a market crash, the housing collapse, a job loss, or a late start, you too, may be facing retirement with less than you expected. The seven-figure target you've been aiming for increasingly feels like a long shot. No wonder Americans' confidence about living well in retirement is at an all-time low. As you'll learn from the people you'll meet here, however, you can enjoy a fulfilling retirement with a smaller-than-hoped-for portfolio. When MONEY asked readers to share stories of scaled-back retirements, more than 100 wrote us to describe lives that were anything but bleak. All had made adjustments, but few found those fixes painful. "People are very resilient and adaptable," says Anthony Webb, a research economist at the Center for Retirement Research. "Even when they have setbacks, they find ways to have an enjoyable retirement." Whether you're already retired or just starting to plan for your post-work life, you should find these six strategies for living well on less instructive -- and the stories of the people behind them inspiring. The strategy: You've probably heard that once you stop working you'll need 70% to 80% of your pre-retirement income to keep up your standard of living. Plug a number like that into a retirement savings calculator and you may come away discouraged about your chances of reaching such a hard-to-attain goal. That high bar, however, doesn't match up with what many retirees report -- and what the data show. In nearly every major category, from housing to entertainment, spending typically peaks when you're in your forties and fifties (the big exception: health care). After age 75, the dropoff is especially steep. Even if you spend more right after you leave work -- on travel, say -- certain savings happen naturally. You're no longer socking away 10% to 15% of your earnings in retirement accounts, forking over more than 7% in payroll taxes, updating your work wardrobe, or buying gas for a commute. At 65, you get a bigger standard deduction on your taxes. With kids out of the house, tuition bills are gone. "You have more time and can spend less by cooking at home," says Boston University professor Laurence Kotlikoff, who has developed software to help people figure out retirement spending needs. "And when people retire, they're also concerned about preserving their assets, so they're more cautious." Cutting back to get by on a smaller nest egg may not be as painful as you fear. Granted, you may have to make tradeoffs, buying a new car less often, or dumping the gym membership in favor of walks. But the Lowrys found that ratcheting down their spending wasn't as tough as they had thought. "There's a lot of stuff you can do that adds up," says Bob. They still take vacations but go every two years instead of annually. They slashed their TV bill by two-thirds by cutting cable and sticking to their $50-a-month Internet. "We can get any shows or movies we want on Hulu or Netflix," notes Bob. When you take these kinds of real-world spending shifts into account, your prospects brighten. Most bleak reports of retirement focus on those 70% to 80% income replacement figures. An intriguing new study of retirement preparedness based on actual spending patterns, though, concludes that most retirees won't run out of money. Using nearly two decades of data from more than 22,000 Americans age 50 and older, Michael Hurd, director of research at the RAND Center for the Study of Aging, found that 71% of retirees ages 65 to 69 are adequately prepared. "Looking at the data this way, there's no reason for all the alarms you see," claims Hurd. Unexpected benefit: Cutting back on long trips let the Lowrys spend more time with their nearby daughters and grandchildren, volunteer, and get involved in their church. "Our lives have never been fuller or more exciting," says Bob. 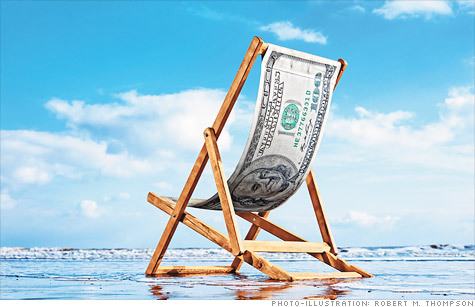 How to get going: Go to Fidelity's Retirement Income Planner. You can plot your spending in 43 categories, from home costs to groceries, and designate an expense as essential or discretionary, making it easier to spot places to cut back. The strategy: When you're working, time is money. Once you retire, you can spend more of that time to save. Economists at the University of Chicago and the University of Rochester found that retirees pay less for food because they shop more often and use coupons more extensively. By doubling their "shopping frequency," older households pay 7% to 10% less per purchase. "Having more time is one of the biggest reasons we're able to save so much," says Mike Dolan, 65, a former New Jersey business school administrator who retired to Bolivia, N.C., seven years ago. Have a question about your retirement savings? Ask the Help Desk. Having more time at your disposal can also save you the cost of hiring a pro. Jim Helms, 70, had hoped to have $1 million by the time he retired this year, but the market downturn whittled his nest egg to $875,000. Helms, a former Air Force officer and mental health counselor, and his wife, Betty, 64, a former librarian, now cook at home regularly, and Jim tackles most of their home repairs. "I'm a fool to pay someone to do something I can do myself," he says. Before the couple added on a 400-square-foot sunroom, they got an estimate of $35,000. Jim did it for $7,000. Unexpected benefit: Preparing your own meals can help you eat healthier. And Jim Helms thinks lawn mowing and other chores don't just save him money: "Doing these things keeps me in better shape too." How to get going: For last-minute hotel and fare deals, sign up for e-mail alerts from Airfarewatchdog.com, Travelzoo.com, and Priceline.com. For coupons on everything from toothpaste to big-screen TVs, go to Coupons.com. The strategy: With housing sucking up a third of the typical American's budget, downsizing to a smaller home is one of the most potent ways to live well on less. You may be able to pump up your nest egg with the proceeds of the sale, and you're sure to spend less on maintenance, utilities, and property taxes year in and year out. Maureen and Hayden Hyde retired in 2008, just as the bear market was gaining steam. But because they'd cut the costs of keeping up a home from $20,700 a year to $5,400 by trading down, the hit their portfolio took didn't crimp their lifestyle. Maureen, now 63, who ran a staffing agency, and Hayden, 70, a former banker, had sold their 5,000-square-foot home with a pool in Tulsa and bought a one-bedroom loft apartment in downtown Santa Fe. A $1,500 annual condo fee has replaced the $7,000 they once spent every year to keep up the yard and pool. Their property taxes fell by 72%, and utilities are a fraction of the cost of heating, powering, and cooling a spacious home. "We spend the money we save on living expenses and traveling," says Maureen. Today the Hydes go to France for three weeks every year, eat out often, and frequent the local opera. Gone are the chores that come with maintaining a big house and property. Two years ago John and Nancy Gobee downsized to help finance a surprise early retirement. John, now 63, and Mary, 61, were both laid off in 2009, three years before they had planned to stop working. By selling their home in Washington, D.C., the Gobees were able to pay off their mortgage and credit card debts and have enough left over to buy a home in central Pennsylvania with cash. "We love where we live," says John. "We walk around with silly grins on our faces all day." To be sure, in many parts of the country selling your home may not be easy nowadays. You need to make your listing look like a bargain, which means setting a price that's at least 10% lower than comparable homes in your neighborhood. "When a home is priced right, it will sell," says Denise Riordan, a Sotheby's International realtor in New York. "If you've been in your home a decade or longer, you are likely to still come out ahead." Trading down to a smaller home isn't the only way to scale back: Getting rid of a car can save you thousands a year on fuel, insurance, and repairs. When Scarsdale, N.Y., retiree Betty Wong Tomita, now 68, closed her executive-recruiting business during the 2008 recession, five years before she had planned to retire, she decided she could do without her car, even though she was still working part-time in nearby New York City. She can hop a train to the city and reach grocery stores and restaurants by foot. Even after paying for train tickets, cabs, and the occasional car rental, Tomita saves about $5,000 a year on insurance, gas, parking, and fees. "It's great," says Tomita, who works about three days a week as a recruiter for a local nonprofit. "I walk a lot more, and I can read on the train." Unexpected benefit: Downsizing, even just selling a bunch of your stuff, can be liberating. A condo means no property to maintain; fewer cars equal fewer repair headaches; and who doesn't find life calmer with less clutter? "We fully expected to sell our condo and move into a house, but we discovered that we like living this way," says Maureen Hyde. "We have more time and less stress." How to get going: Calculate how a smaller home will cut your costs, including your property taxes and homeowners insurance, with Boston University professor Kotlikoff's ESPlanner Basic. Figure your savings from shedding a car with Edmunds.com's True Cost to Own Calculator. Ditching a 2009 Honda Accord, for example, saves $30,000 over five years. The strategy: Most retirees want to stay close to family and friends. Indeed, in a 2010 survey by home-builder Del Webb, just a third of early boomers said they'd move in retirement; of those, less than half expected to decamp to a different state. If you're among the minority willing to pull up stakes, housing can provide the most dramatic savings: Think what the proceeds from your Boston home (median price: $356,000) will buy you in Orlando ($120,000). You can cut your taxes too. Even long-term nursing care can be much cheaper in certain parts of the U.S. This is one of the most effective ways to improve your retirement prospects. That's what Mike and Karen Dolan found when they moved from New Jersey to North Carolina. They bought a bigger home for less money, paying $400,000 for a 2,800-square-foot, four-bedroom house. (Their New Jersey home was worth $450,000.) They slashed their property taxes from $10,000 to $1,500 a year. New Jersey has among the highest sales-tax rates, at 7%, vs. 5.75% in North Carolina, which is one of 27 states that don't tax Social Security benefits. Still, don't ignore the emotional cost of leaving friends and family. Catherine Frank, executive director of the North Carolina Center for Creative Retirement, suggests making long visits at different times of the year to ensure a new town is right for you. Unexpected benefit: The Dolans are enjoying the slower pace of life. "We can get to the beach in 10 minutes," says Mike. "There are no traffic jams or beeping horns. The monetary savings are obvious, but the lack of stress and living in a warm and welcoming community are immeasurable." How to get going: To check out 25 sweet affordable retirement towns, see Best Places to Retire. Compare tax rates at taxfoundation.org. Use our site's Cost of Living Comparison tool to see how much you'll save. The strategy: If you find yourself at the finish line with less money than you had hoped, one solution is to move the finish line. "Even with the recession, the number of people staying in the workforce beyond traditional retirement age is increasing," says Phyllis Segal, vice president of the boomer think tank Civic Ventures. Since the 1990s, the average retirement age has crept up from 62 to 64 for men and from 60 to 62 for women, according to the Center for Retirement Research. Of course, going to the office every day may not be your idea of retirement. You have another option: Line up enough part-time work to bridge the gap between your savings and spending. Collecting even a modest paycheck can let you put off tapping your retirement accounts and wait to claim Social Security benefits, boosting your income later. That's the strategy Joan Barnes, 62, is using to make her money last. When Barnes, a divorcee who lives in the Chicago suburb of Orland Park, Ill., took early retirement from her job as a training manager at a telecom company a decade ago, she knew that her $580,000 buyout package might not support a retirement that could last 40 years. Her first job was at a craft store -- building dollhouses is a hobby. She then spent seven years at a nonprofit, running a job skills program, before retiring altogether earlier this year and finally tapping her savings. "I didn't work every day, but it was work I really enjoyed, and it provided income, about $2,000 a month," says Barnes. Even while she worked, she found time to travel, go to museums and plays, volunteer tutoring adults in literacy, and visit her grandkids, who live a few hours away. "I have less money than when I worked," says Barnes, "but I enjoy my life even more." Tracking down flexible or part-time work isn't that different from hunting for a full-time job. Talk to family and friends, network by joining community groups or associations, or volunteer. Before you can apply your skills to a new field, you may need training or classes. Many community colleges have programs that can help you with the transition. Unexpected benefit: A post-career job can be fulfilling too. More than two-thirds of retirees who work part-time say they do so to stay active and challenged, according to a survey by Encore.org. That's more than those citing income (44%) or health insurance (42%) as a reason to work. How to get going: Search for part-time, flexible, or work-at-home jobs at FlexJobs.com. Or visit one of the many sites that cater to 50-plus job seekers. Waiting pays: By working part-time, Joan Barnes delayed dipping into a $360,000 portfolio for nine years, upping what she can now collect. The strategy: You'll have a hard time living lean if you're still paying off your mortgage, not to mention struggling under credit card debt. Yet more and more retirees are facing those obstacles. The Joint Center for Housing Studies at Harvard reports that 64% of people in their late fifties and early sixties have a mortgage or home-equity debt, up from 49% in 1989. Credit card debt is up 26% in the past five years among those 65 and older, says New York think tank Demos. The lack of debt payments cleared the way for Don Glenn to retire five years ago. After he was laid off from his job as an IT director at a health care company in Bellevue, Neb., at age 62, he was soon interviewing for a new position. But midway through the job hunt, he decided he didn't want to return to a high-stress office. The decision was made easier for Don, now 67, and his wife, Linda, 64, by the fact that they had paid off their mortgage -- once 25% of their budget -- and had no other debts. "I knew if we cut back a little, we could do it," says Don. "We had the security of knowing our biggest expenses were taken care of." Erasing your debts isn't a trick you can pull off without planning. Start whittling away in the decades leading up to retirement, but not at the expense of saving: Fund your 401(k) enough to earn the full employer match. Then turn to high-rate credit card debt. That payoff is sure to be higher than what you can reliably earn elsewhere, says Miami financial planner Ellen Siegel. Unexpected benefit: Peace of mind. "Life is carefree without any debt and a mortgage-free home," says down-sizer John Gobee. How to get going: To run the math on refinancing your mortgage into a shorter-term loan, or to see how many years extra payments will take off your loan, use the calculators at mortgage-loan.com. Additional reporting by Susie Poppick.